This Fabric Pin Board tutorial really is very easy to follow. It took me longer to choose the fabric than it did to make the fabric pin board. I was quite pleased to have found a bargain of a cork pin board just £1.99 from B&M Bargins, although I did splash out on the fabric £12.99 a metre. Here is what you will need to make a fabric pin board? Consider which way you plan to hang your pin board, portrait or landscape and make sure you cut out your fabric so the pattern is in the right direction. Step 1 Measure and cut out the fabric, I used pinking scissors to help prevent fraying. Iron the fabric. Step 2 Measure and cut out the wadding. Step 3 Place your fabric on the table so you are looking at the wrong side, place the wadding on top of this. Place your pin board cork side down. I then used one pin on each edge to lightly secure the fabric to the back of the pin board, turn over and make sure you are happy with how it looks. Step 4 Turn back over and using a staple gun staple through the fabric and wadding onto the wooden frame. Fold the corners so that you do not have a lot of bulk showing. Step 5 If needed trim any excess fabric showing at the back, I know some of you will have allowed for extra, just in case. Step 6 Add ribbon making sure there is some tension to it. Stapling to the back as with the fabric. There is no wrong or right way to do this just depends how much room you need to secure notes/photos or items to your pin board. Push through a map pin where the ribbons cross. Update - you should push your map pins up at an angle, this way they are less likely to come loose. Step 7 Fixing to the wall. My cork board came with wall fixings, which I screwed through the fabric into the top of surrounding wood using my hands. 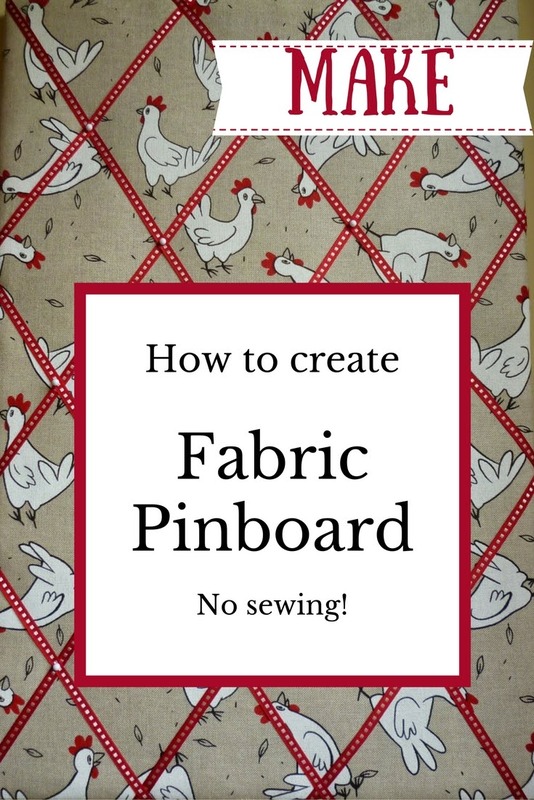 I hope you find this tutorial useful, if you do make a pin board yourself please leave me a comment with a link to it, I would love to see it. I made this and really enjoyed it! very easy make and delighted with the professional end result. Set my heart on doing this but actually would have been cheaper to buy one!! Couple of things to note, start your ribbon by making a cross pinned from the corners, it's easier to line up the other ribbons. Once made up I discovered that because I'd used padding, my drawing pins wouldn't stay in and kept popping off! So I have to just use the ribbon to slide notes into. Also couldn't make my drawing pins hold the ribbon in place so had to use fabric pins and bend them over on the reverse to keep in place then tape over so that they were safe. Thanks for sharing this great revamp! Hi Angela this looks really lovely, I wouldn't have thought to stretch the fabric over the frame but it looks fine. I am trying to organize my sewing room and a notice board was on the list, isn't Pinterest great. Hi, I've already made a start on my pin board but wasn't sure how I wanted the ribbon to look so checked out this site. Love your version but also feel that the pins wouldn't hold well enough as I have used sponge by the meter instead of wadding (why didn't I think of this! ), so I intend to staple the ribbon centres then either sew or glue pretty buttons over the top so that you can't see the staples. I'll post a pic when I've done it.